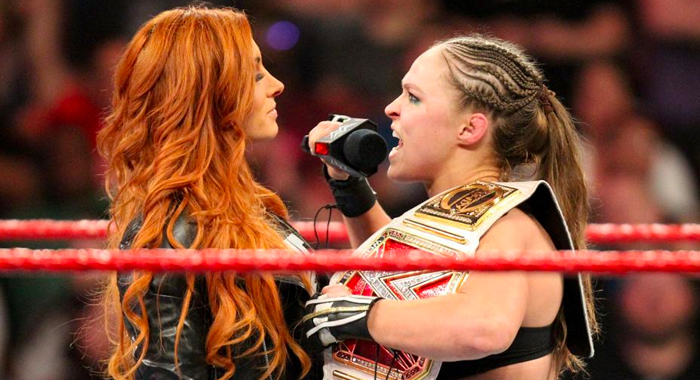 Ronda Rousey and Becky Lynch continue to wage war on social media. The Raw Women”s champion and The Man are firing shots at each other and the longer they battle, the more the fans marvel at their commitment to the storyline. Indeed, it’s becoming difficult for many to know the difference between fiction and reality here. Rousey has heat with the WWE faithful, so anything she says seems to come out of desperation to save her character. But the truth is that Ronda is playing her part and the work she’s doing online is to further the angle between her and Lynch. The two women are heading for a major showdown at WrestleMania 35, in what will likely be the main event of the night. Lynch earned the right to face Ronda by winning the Women’s Royal Rumble Match and now they’re on the way to making history on The Grandest Stage of Them All.